It is not something new to be able to generate electricity through kinetic energy conversion to ensure your mobile devices are still in operable mode during emergency situation. However, this newly launched innovative product from Orange, the famous service provider may looks unique and difference from other existing solutions. 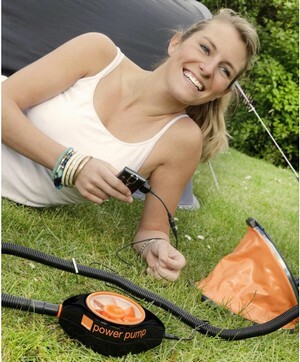 With a slightly different approach, Orange Power Pump utilizes a conventional foot pump to generate air pressure that can be used to power up your mobile device while on the move. The mechanism is simple – with a normal way of how you operate the foot pump to generate air pressure, the energy can be converted to electricity to supply sufficient current for your cell phone. Although there is no way to measure the efficiency, but the device is claimed to be able to supply a talk time of five minutes with an equivalent of air pressure needed to fill up a pillow. Good thing is, the solution is eco-friendly and even though it won’t help you to save much on your electricity bill, but hopefully it can create awareness to consumers on green environment while able to serve for short emergency talk time when necessary. No pricing info yet, the service provider will be demonstrating actual prototype during the Glastonbury Festival held in Pilton, Somerset next month.